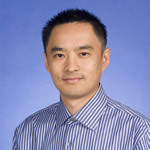 Xiaosong Li, Assistant Professor of Chemistry, has been awarded a 2011 Alfred P. Sloan Research Fellowship. The fellowships are given to early-career scientists and scholars in recognition of achievement and the potential to contribute substantially to their fields. Research in the Li group focuses on developing and applying electronic structure theories and ab initio molecular dynamics for studying properties and reactions, in particular non-adiabatic reactions that take place in large systems, such as polymers, biomolecules, and clusters. Read more about Sloan Research Fellowships. To learn more about Xiaosong Li’s research, visit his faculty page and research group website.